Founded over 160 years ago and later acquired by Genuine Parts Company in 1975, S.P. 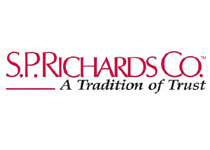 Richards is one of the major distribution companies in the North American market. A network of 55 distribution centers allow the company to facilitate customers all over North America. S.P. Richards showcases over 98,000 products including general office supplies and furniture, technology supplies and accessories, facility and break room supplies, disposable food service products, school and educational products, safety & security items and healthcare products. S.P. Richards provides a complete office products supply chain with inventory, logistics, sales and marketing solutions and services to their business customers. The company assists its vendor partners and industry system providers with marketing and distribution as well as data and online content and product information so that they may expand and flourish in the ever changing market.